We all know the importance of protecting your humble abode from a fire. Homeowners often forget how critical a proper fire safety system matters to their home and their family. We all know the importance of protecting your humble abode from a fire. Homeowners often forget how critical a proper fire safety system matters to their home and their family. One of the first steps to getting a complete fire system in place is to get a fire alarm. More often than not, the fire alarm is going to be your first signal that there is a fire emergency. Here is a valuable guide that will allow you to choose the perfect fire systems for your home. From carbon monoxide to regular fire alarms, your home must be equipped with both. 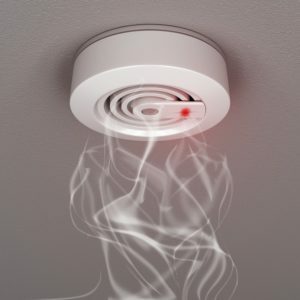 Having both a fire alarm and carbon monoxide detector is the perfect combination when it comes to fire safety in your home. When it comes to fire extinguishers, it’s critical that you read the label. There are a variety of different kinds of fire extinguishers out there, and you’ll need to know which one is the right one to use for the particular fire that you are dealing with. For the most part, household fire extinguishers are labeled as A, B, or C. This will quickly tell the homeowner which type of fire that particular extinguisher is effective against. A will work for basic combustibles like wood, paper, and cloth. B-type fire extinguishers are used to combat fires that are being fueled by flammable liquids like gasoline or cooking oil. And C-type fire extinguishers are used to fight fires dealing with live electricity. There will be fine print on the actual fire extinguisher that will alert the user to the proper type of fire extinguisher they are using and which type of material that will work against. Even though it’s excellent to know which type of fire extinguisher to use on any specific occasion, knowing how to use a fire extinguisher is essential. Fire safety professionals will typically advise homeowners to learn how to use an extinguisher before any potential fire emergency even arises. This entry was posted on Thursday, March 21st, 2019 at 9:00 am. Both comments and pings are currently closed.